Every evening at 6:20 on the dot we make sure that we have Cbeebies (channel 121) on for Blake for his favorite program - In the night garden. It has become routine for us to do this every evening and he has loved watching In the night garden since he was tiny. Iggle Piggle is Blake's favorite character and he gets very excited when he comes on the screen. As a parent I must admit the songs are rather catchy and I sometimes find myself humming the theme tune during the day. Whenever Blake hears the theme tune he is straight to the TV and there is no getting him away from it. Blake is such an In the night garden fan that he has quite a selection of toys, books and clothing. His favourite is a large Iggle Piggle which Stuart purchased for him last year when we were browsing in Toys R Us. 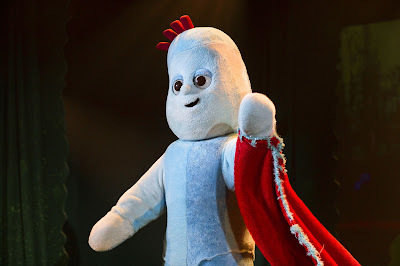 So I knew that I wanted us to take him to In the night garden live and so it was decided that we would make a weekend of it and travel up to Manchester. There are a choice of two shows; the Ninky Nonk show where Iggle Piggle loses his blanket and the the Pinky Ponk Show where Makka Pakka washes faces. We went to the Ninky Nonk show. We ended up turning up at the showdome 1 minute before the show was due to start as we had actually got lost on the way. On arrival the staff were lovely - they showed us where to park our buggy and then took us to where there was space for us to sit. 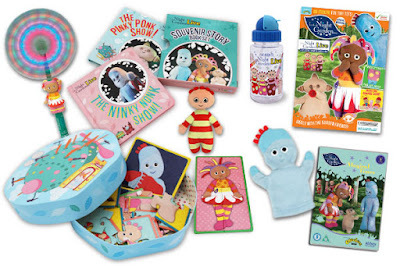 Iggle Piggle, Upsy Daisy, Makka Pakka, the Tomliboos and the Teeny Tiny Pontipines. The show brought the dome to life with magical music, puppets, actors and full sized versions of Iggle Piggle, Uspy Daisy and Makka Pakka. Blake hardly took his eyes away from the stage and when he did it was only to look at one of us to giggle and smile. The show is also narrated by Sir Derek Jacobi who is the voice of the TV show. In the Ninky Nonk show Iggle Piggle loses his blanket and all his friends help him to find it. All characters make an appearance in both shows so there will be no need for your child/ren to miss there favorite. Stuart and I were extremely impressed with how the show was put together and Blake was transfixed from the beginning. In the foyer there are plenty of souvenirs starting at as little as £5 so there is bound to be something you can find for your little In the night garden fan. We also picked up a goody bag that we had purchased in advance for £29 which on the day cost £39 with goodies worth over £60. The goody bags offer you great value. Because it's sold as a package, you get a big saving on retail prices. We are very impressed with the contents of the goody bag and there are things suitable for all ages. Blake especially loves the light up windmill and Iggle Piggle puppet. Last of all we chose to pay £15 so that Blake could meet Iggle Piggle. There was a choice of meeting Iggle Piggle or Upsy Daisy after the show. The special experience takes place in a private area when the only people present will be your family, an usher and the character. The meeting lasts between 2-3 minutes where you will have the chance to have your photo taken. The maximum number of people (children and adults) in one meeting is 5, of which no more than 3 can be children. When we first went in Blake was rather shy on meeting his favourite character which made it hard to get a photo of just him on his own. However we manged to get one with all of us and as you can see Blake would rather look at Iggle Piggle than the camera. Overall it was such a fantastic family day out we all thoroughly enjoyed ourselves especially Blake. 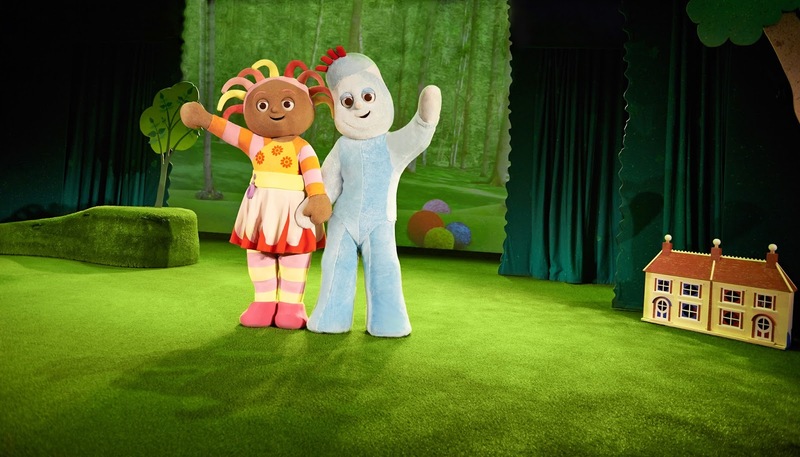 *We were provided tickets to In the night garden live for the purpose of this review. However all photos, thoughts and opinions are my own. This program really confuses me but my 2 year old niece loves it! When she is a little older we may have to go to this. My nephew LOVES In The Night Garden, so I know that he would love this. Oh my, I remember those times when little T used to watch In the night garden too. That was part of our bedtime routine when she was your little one's age. Brings back so much lovely memories. How nice to able able to attend his fav show. It looks everyone had a good time. I remember going to see Care Bears live when I was a kid - always so fun to see your favourite TV characters come to life! No wonder he loves it. The characters are quite adorable, and what a fun show it was as well. I'm glad you all had such a lovely time! My kids would love this show. They are huge fans of 'In the Night Garden'. Love the last image especially. I'm in two minds about taking my son! We'd love to see In the Night Garden Live! I've grown up with Ickle Pickle! My 2 years old baby loves it too. You are lucky to see such a show. I am sure my little one will be happy to see them live. Looks like you had a great time, we never did anything like this growing up! Wow! Sounds like Blake had a great time! This looks like a fun entertainment for the little ones. My little sister would be so jealous as she loves in the night garden. I didn't know that they do it live. So many little ones would love this. My nephew is obsessed with it. Looks like a great show - so cool you got photos with the characters too! What fantastic photos. Looks like you all had a fun time and great you got to have photos with the characters!